If you've ever taken your dog to the groomer, then you know how fresh and fluffy our dogs look when they come back. While we try to bathe our dogs at home, the result never quite comes out the same as salon-fresh fur. But the reason our styling attempts don't quite measure up is because groomers use a special technique called fluff drying to give our dogs that special soft look. Fluff drying will take practice to master, but you can definitely do it at home. Fluff drying involves using a blow dryer to straighten and volumize your dog's hair. Your groomer does this to make it easier to cut the hair straight. However, the side benefit is that the technique gives your dog that adorable, fluffy look. 1. Wash and shampoo your dog and then rinse thoroughly. A clean coat will respond better to the fluffing process than if it has any dirt or grease. Make sure to rinse the dog thoroughly. 2. Pat dry the dog's coat with a towel, rather than rubbing the fur dry. If you rub the dog's fur too much, it can mat it, which isn't what you want. After you towel the dog off, run the slicker brush through its fur to get as much extra water off of your dog's coat as possible. 3. Blow dry the dog's hair using the slicker brush. Rather than blow drying the hair flat down, you're going to add as much body as possible. Use the brush to lift the hair up by the roots, then point the hair dryer at the brush against the grain as you slowly brush through the hair to fluff it. If you're familiar with blowing out human hair, the technique is similar. Make sure the air is set to warm and not hot. 4. Continue over your dog's entire coat, a small area at a time. 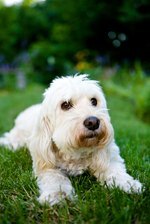 In order to keep your dog's coat fluffy, you need to take it a bit at a time. Once your dog's coat is fluffy, you'll want to double check that there aren't any mats. If you find a mat in your dog's hair, turn the hair drying on cool and blow it on low with the grain of the hair as you brush. That will loosen the mat without disturbing the fluff of your dog's coat. Once you've freed the coat of all its mats, go over the hair once more, brushing against the grain to hold the fluff. You should have a stunning, fluffy beauty. Don't worry if your dog doesn't look quite perfect on your first attempt, the technique takes a bit of getting used to. Don't let the hair dryer blow into your dog's eyes. Do make sure to give your dog a few breaks with a delicious treat. Don't blow the hair dryer too close to (or inside) your dog's ears, because the sound and air can be tough on their sensitive ears. Do be careful to wash all the shampoo from your dog's coat, because the product will weigh down your dog's hair. 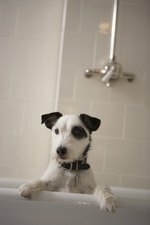 With a little practice, you'll make your pup look fit for a starring role with every bath. And we know your pup will appreciate all your extra attention.